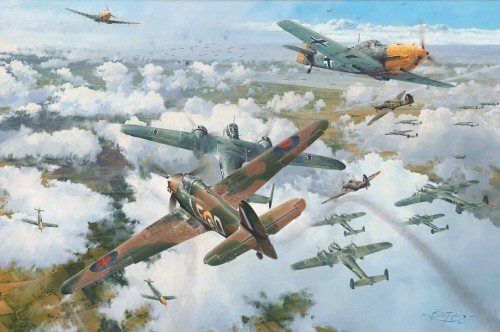 Hitler's air force returned to mass daylight raids yesterday and the RAF gave them the most shattering defeat they have ever known. The Daily Mail 16 Sept 1940 Sunday 15 September 1940 and Luftwaffe supremo Hermann Goering believed victory over the RAF was at hand. Today, he decreed, would be the day that his 'glorious' Luftwaffe would finally break the back of Fighter Command's stubborn resistance. Or so he believed. In response to a massed formation of enemy aircraft detected heading for London, Air Vice Marshal Keith Park commanding 11 Group scrambled his squadrons. He also requested that 12 Group bring Douglas Bader's 'Big Wing' down from Duxford. Every available pilot and machine was committed. Prime Minister Winston Churchill turned to Park and asked "What other reserves have we" "There are none", Park replied. Bader now had five squadrons racing south, meeting what remained of the enemy on the outskirts of London. With a successful morning behind them the RAF fighters raced back to re-fuel and re-arm. Just after 14.00 hrs another enemy battle group was observed and this time the formations were even larger. Bader's Wing was scrambled once more. In his painting Robert Taylor takes us to the heart of the action with breathtaking clarity as he portrays Bader leading his wing into the fray on that afternoon of 15 September 1940. As their Bf109 escorts begin to run out of fuel, the enemy bombers were left to fend for themselves. They were savaged. By late afternoon it was over and whilst the Daily Mail and the press made much of the RAF's initial optimistic claims – the Luftwaffe had actually lost nearly 60 aircraft and 150 aircrew. The RAF had lost less than half that number of aircraft and only 13 pilots. The tide of the Battle of Britain had turned in the RAF's favour, and German High Command knew it. The famous names who have signed this edition bears testament to the long association that has existed between these distinguished veterans and the Military Gallery over the last forty years. Generalleutnant ADOLF GALLAND Knight's Cross with Oak Leaves, Swords & Diamonds - Commanded JG26 on Bf109's / 104 victories - the legendary Luftwaffe Fighter General. For the serious enthusiast this edition represents the ultimate in aviation art and historic autograph collecting. With all the signatures of the Anniversary Edition, each print is issued with one of Robert Taylor’s stunning original pencil drawings, themed on a classic Battle of Britain subject and signed by ten iconic RAF Battle of Britain Aircrew. Each unique drawing is conservation matted to include a further eight original signatures, representing some of the most famous RAF and Luftwaffe Aircrew to fly in the Battle of Britain. Limited by its rarity the Tribute Edition is restricted to just TEN copies.